It is through a Martyr’s palm-branch that we must today see the Paschal Mystery. 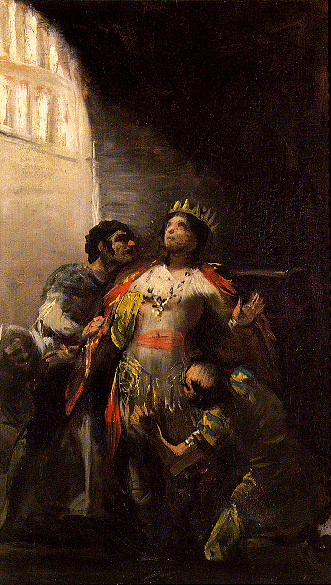 Hermenegild, a young Visigoth Prince, is put to death by his heretical father because he courageously refused to receive his Easter Communion from an Arian Bishop. The Martyr knew that the Eucharist is the sacred symbol of Catholic unity; and that we are not allowed to approach the Holy Table in company with them that are not in the true Church. A sacrilegious consecration gives heretics the real possession of the Divine Mystery, if the priestly character be in him who dares to offer Sacrifice to the God whom he blasphemes; but the Catholic who knows that he may not so much as pray with heretics, shudders at the sight of the profanation, and would rather die than share, by his presence, in insulting our Redeemer in that very Sacrifice and Sacrament, which were instituted that we might all be made one in God. The blood of the martyr produced its fruit: Spain threw off the chains of heresy that had enslaved her, and a Council, held at Toledo, completed the work of conversion begun by Hermenegild’s sacrifice. There are very few instances recorded in history of a whole Nation rising up in a mass to abjure heresy; but Spain did it, for she seems to be a country on which heaven lavishes exceptional blessings. Shortly after this she was put through the ordeal of the Saracen invasion; she triumphed here again by the bravery of her children; and ever since then, her Faith has been so staunch and so pure as to merit for her the proud title of The Catholic Kingdom. Hermenegildus rex, Leovigildi regis Visigothorum filius, ab ariana hæresi ad fidem catholicam, viro reverendissimo Leandro Hispalensi Episcopo, dudem mihi in amicitiis familiariter juncto, prædicante, conversus est. Quem pater arianus, ut ad eamdem hæresim rediret, et præmiis suadere, et minis terrere conatus est. Cumque ille constantissime responderet, numquam se veram fidem posse relinquere, quam semel agnovisset: iratus pater eum privavit regno, rebusque exsploiavit omnibus. Cumque nec sic virtutem mentis illius emollire valuisset; in arcta illum custodia concludens, collum manusque illius ferro ligavit. Cœpit itaque Hermenegildus rex juvenis terrenum regnum despicere, et forti desiderio cœleste quærens, in ciliciis vinculatus jacens, omnipotenti Deo, ad confortandum se, preces effundere; tantoque sublimius gloriam transeuntis mundi despicere, quanto et religatus agnoverat nihil fuisse, quod potuerit auferri. King Hermenegild, son of Leovigild king of the Visigoths, was converted, from the Arian heresy, to the Catholic faith, by the preaching of the venerable Leander, Bishop of Seville, one of my oldest and dearest friends. His father, who continued in the Arian heresy, did his utmost, both by promises, and threats, to induce him to apostatize. But Hermenegild returned him ever the same answer, that he never could abandon the true faith, after having once known it. The father, in a fit of displeasure, deprived him not only of his right to the throne, but of everything he possessed. And when even this failed to break the energy of his soul, he had him put into close confinement with chains on his neck and hands. Hereupon the youthful king Hermenegild began to despise the earthly, and ardently to long for the heavenly, kingdom. Thus fettered, and wearing a hairshirt, he besought the Omnipotent God to support him. As to the glory of this fleeting world, he nobly looked on it with disdain, the more so as his captivity taught him the nothingness of that which could thus be taken from him. Superveniente autem Paschalis festivitatis die, intempestæ noctis silentio, ad eum perfidus pater arianum Episcopum misit, ut ex ejus manu sacrilegæ consecrationis communionem perciperet, atque her hoc ad patris gratiam redire mereretur. Sed vir Deo deditus, ariano Episcopo venienti exprobravit ut debuit, ejusque a se perfidiam dignis increpationibus repulit: quia etsi exterius jacebat ligatus, apud se tamen in magno mentis culmine stabat securus. Ad se itaque reverso Episcopo, arianus pater infremuit, statimque suos apparitores misit, qui constantissimum confessorem Dei, illic ubi jacebat, occiderent; quod et factum est. Nam mox ut ingressi sunt, securim cerebro ejus infigentes, vitam corporis abstulerunt, hocque in eo valuerunt, perimere, quod ipsum quoque qui peremptus est, in se constiterat despexisse. Sed pro istendenda vera ejus gloria, superna quoque non defuere miracula. Nam cœpit in nocturno silentio psalmodiæ cantus ad corpus ejusdem regis et martyris audiri, atque ideo veraciter regis, quia et martyris. It was the Feast of Easter. At an early hour of the night, when all was still, his wicked father sent an Arian Bishop to him, with this message, that if he would receive Communion from his hands (the Communion of a sacrilegious consecration! ), he should be restored to favor. True to his Creator, the man of God gave a merited reproof to the Arian Bishop, and, with holy indignation, rejected his sinful offer; for though his body lay prostrate in chains, his soul stood on ground beyond the reach of tyranny. The Bishop therefore, returned whence he had come. The Arian father raged, and straightway send his lictors, bidding them repair to the prison of the unflinching Confessor of the Lord, and murder him on the spot. They obeyed; they entered the prison; they cleft his skull with a sword; they took away the life of the body, and slew what he, the slain one, had sworn to count as vile. Miracles soon followed, whereby heaven testified to the true glory of Hermenegild; for during the night, there was heard sweet music nigh to the body of the King and Martyr—King indeed, because he was a Martyr. Quidam etiam ferunt, quod illic nocturno tempore accensæ lampades apparebant. Unde et factum est, quatenus corpus illuis, ut videlicet martyris, jure a cunctis Fidelibus venerari debuisset. Pater vero perfidus et Parracida commotus pœnitentia, hoc fecisse se doluit, nec tamen usque ad obtinendam salutem pœnituit. Nam quia vera esset Catholica fides agnovit, sed gentis suæ timore perterritus, ad hanc pervenire non meruit. Qui oborta ægritudine, ad extrema perductus est, et Leandro Episcopo, quem prius vehementer afflixerat, Reccaredum regem filium suum, quem in sua hæresi relinquebat, commendare curavit, ut in ipso quoque talia faceret, qualia et in fratre suis exhortationibus fecisset. Qua commendatione expleta, defunctus est. Post cujus mortem, Reccaredus rex non patrem perfidum, sed fratrem martyrem sequens, ab arianæ hæreseos pravitate conversus est, totamque Visigothorum gentem ita ad veram perduxit fidem, ut nullum in suo regno militare permitteret, qui regni Dei hostis existere per hæreticam pravitatem non timeret. Nec mirum quod veræ fidei prædicator factus est, qui frater est martyris: cujus hunc quoque merita adjuvant, ut ad omnipotentis Dei gremium tam multos reducat. Pope Urban the Eighth composed the two following Hymns for the Feast of the holy Martyr: we unite them under one conclusion. Cœli cœtibus inserit. The royal throne of heroic Iberia counts thee, Hermenegild, as one of its glories: so, too, do the Martyrs, whose love of Christ has numbered them among the Blessed of heaven. Cautus noxia, quæ placent. How courageously didst thou keep thy promised allegiance to God! He was dear to thee above all things else; and as to the dangerous pleasures of this world, thou warily didst reject them. Quo veri via dirigit! Thou restrainedst the passions, which excite and foster vice. Thou marchedst onwards, with unfaltering step, to where the path of truth directs. Regnandive cupidine. Thy father’s promises could not seduce thee. The luxuries of a life of ease and wealth, the glitter of diamonds, the prospect of a throne—they could not allure thee. Præfers gaudia cœlitum. Thou wast not affrighted by the threat of a cruel death, or by the executioner’s merciless rage; for the everlasting joys of heaven were dearer to thee than those of time. Pronis auribus excipe. Do thou now kindly protect us from thy heavenly throne, and graciously receive the prayers we present to thee whilst celebrating the palm made thine by martyrdom. Amen. To the Father, the Lord of all things, be eternal honor! Let the Faithful assembled here in prayer, glorify the Son; let them sing forth endless praise to the Holy Ghost. Amen. We offer thee, O brave witness to the truth of holy Faith! our admiration and gratitude. Thy courageous death was proof of the love thou hadst for Christ; and thy contempt of earthly honors teaches us to despise them. Heir to a throne, a prison was thy abode here below. It was from thy prison that thou ascendedst to heaven, wearing on thy brow the laurels of Martyrdom—a crown far brighter than that which was offered thee on condition of thy apostatizing from the Faith. Pray now for us: the Church asks it of thee, by inserting thy name in the Calendar of her Saints. The Pasch was the day of thy triumph: obtain for us that this may be a true Pasch to us—a real resurrection, which may lead us to the heaven above,where we may enjoy, with thee, the sight of our Risen Jesus. Intercede for us, that we may be firm in the Faith, obedient to the teachings of holy Church, and enemies to every error and innovation. Protect Spain, thy fatherland, which owes to thy Martyrdom long centuries of loyalty to the true Faith. Pray for her, that she may ever continue to merit her glorious title of The Catholic Kingdom.